Monday was Thanksgiving in Canada, so the Diva Challenge was postponed until Tuesday. This week’s Challenge was to use the tangle Onion Drops created by Shasta Garcia. 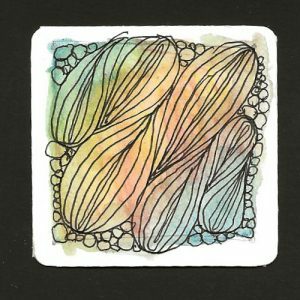 It’s one of the tangles for Inktober Tangles — a list of daily tangles compiled by Stephanie Jennifer. This is a new tangle for me, and I found it to be very relaxing with its big loops and auras. The stepouts and a video can be found on Shasta’s blog. I chose to draw the tangle as a monotangle on a Bijou tile that had a watercolor background created with Derwent Inktense pencils. They look like gourds on that beautiful autumn-colored background. A perfect seasonal treat!